I’m Not An Expert On Showerheads, But I Stayed At A Holiday Inn Express Last Night! So we didn’t camp (as planned). We stayed at a Holiday Inn Express instead. What’s So Great About Holiday Inn Express? One of the first things we noticed was the very modern bathroom & shower! No joke. You could practically LIVE in that bathroom — it was so spacious, and clean, and there were so many efficiencies. The hip and cool shower area. Jim noticed the arched shower rod and hookless shower curtain liner first. I noticed the powerful water pressure and multi-setting shower head! Neither of us noticed the “proprietary cinnamon roll-inspired scent” (see below). So, What’s With Those Showers? We enjoyed our night at the Holiday Inn Express (exit 27 off I-65 in South Carolina) very much. We especially enjoyed the free high-speed Internet, and we even found several tasty treats on the FREE breakfast bar the next morning which we enjoyed. But once we hit the road, what’s the first billboard we saw? Here’s the billboard ad that was mentioned on the front page of USAToday. 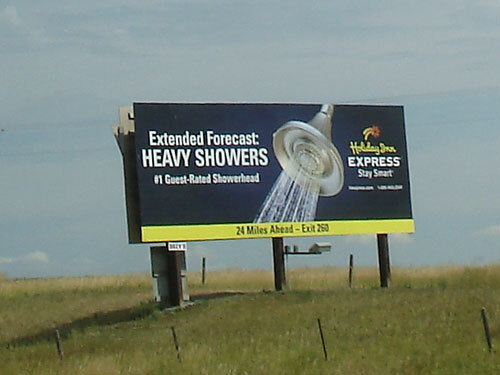 I had to laugh… A high-dollar billboard to tout the praises of a SHOWER HEAD?! While I enjoyed the experience myself, I had no idea that it warranted something as bold as THIS. So, you know me… I had to research it and find out why the showerhead at the Holiday Inn Express — not just the one WE stayed at, but ALL of them — is so highly rated. Sometimes “Strong Showers” Are A GOOD Thing! While “showers” are usually not our friend on such trips (…it ALWAYS rains on our parade when we’re out of town), I would welcome the opportunity to experience strong showers at a Holiday Inn Express again! Check out this interactive video demo of the Kohler Stay Smart showerhead — the #1 guest-rated showerhead used at all Holiday Inn Express hotels! …See why the curved shower curtain rod & shower curtains are so cool. …Change the settings yourself and see how the water pressure changes. …Get a full rotating view of the showerhead itself. …Take the online quiz & see which setting is best for you. …See how you get 25% more space in this shower, thanks to the curved shower rod. …Watch a handful of comical TV commercials promoting this showerhead. Harris Interactive conducted the survey by phone between March 3-5, 2005 among a nationwide cross section of 1,013 U.S. adults ages 18 and over (508 men, 505 women). Harris found that 73% of U.S. adults are not satisfied with the current state of hotel bathrooms, guests’ top complaint is that the water pressure in hotel showers is too low or too high (26%), 14% weren’t happy with the quality of the bath linens, and 13% are looking for more space in the shower. Holiday Inn Express spent $20 million on this bathroom upgrade. A total of 1,300 Holiday Inn Express locations in North America received the upgrade. That means a total of 120,000 showerheads were replaced because all rooms at a Holiday Inn Express now feature the Kohler Stay Smart showerhead. It’s a proprietary multi-function showerhead which automatically compensates for a variety of water pressure challenges. The showerhead was tested by more than 7,000 guests at 28 hotels across the United States where it became “the #1 guest-rated showerhead”. More than one million new towels were purchased for this bathroom renovation. The towels are 20% larger than the old towels, as well as thicker and more absorbent. The curved rod, combined with weighted magnets on the shower curtain prevents the shower curtain from “clinging”. Amenities include squeezable bottles that feature flip-top caps for ease of use. Each product (shampoo, conditioner, soap, lotion, etc.) has “a proprietary scent”: fresh baked cinnamon! They tested more than 100 scents to get the perfect formula for the bath products. The proprietary cinnamon scent is in keeping with the famous hot cinnamon rolls served at Holiday Inn Express hotels. Guests’ reactions to the upgrades have been so positive that Holiday Inn Express has responded by making the showerhead and other bathroom elements available for purchase online. Word is, over 500 guests purchased the Stay Smart showerhead by Kohler in the first 3 months that it was available! Here’s a personal review of the Holiday Inn Express showerhead. Check out these Holiday Inn Express facts & stats! These Hampton Inn Pillows are worth every down-filled moment. We bought 4!